Before a career in public relations, Olympic work, college and high school jobs and mowing lawns as a fifth grade entrepreneurial business, my lofty employment goals extended all the way to the corner of our suburban Oklahoma City driveway. I wanted to be a garbageman. As a third-grader at home enjoying summer break, on Tuesday and Friday mornings in Edmond, Okla., I leaped out of bed, threw on shorts and a tank top, striped tube socks and Nike shoes, and grabbed some garden gloves to anxiously await the arrival of the city sanitation truck. And with my mother's permission, for a couple of morning hours I would join the local garbage men in heaving bags of trash into the back of their truck. Slinging Hefty bags and moving full trash cans -- in those days without wheels and rarely made of lightweight plastic -- is hard, messy work. But it has its perks. In 1982, soda can recycling was fairly new to Oklahoma, and it was fun to retrieve a few empty Dr. Pepper or Shasta containers for the next trek to the aluminum collection at Wynn's IGA. 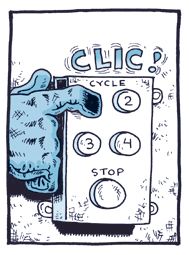 One time, a crew member even let me pull the handle to engage the truck's compacting machinery, and he gave me 25 cents -- a whole quarter -- telling me "thanks" and "good job." It was great! My garbage collection early retirement day arrived July 3, 1982. That morning, I overslept and ran out of the house with tennis shoes sans tube socks. On the mile-long trash walk from house to house, I earned some major blisters on my sockless heels and toes, forcing cancellation of a highly anticipated decorated bike ride in the July 4 parade. My feet still hurt the following trash day, and after another week my parents and youthful friends (and their parents) talked me away from again joining the brigade of municipal workers collecting refuse. 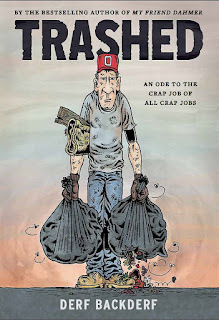 My garbage collecting summer memories got renewed attention this week while reading an outstanding graphic novel titled "Trashed" by the illustrator/cartoonist John "Derf" Backderf. Backderf is best known as creator of the weekly cartoon "The City," a dry-humor gem which skewered American suburban culture and politics during its run of nearly 25 years (1990 to 2014). 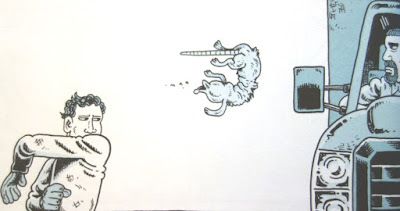 I used to clip and save Derf items from the "City Pages" in Minneapolis and later from alternative weeklies in St. Louis and Atlanta, and wrote about Backderf in early 2009 on this blog. Raised in an area between Cleveland and Akron, Ohio, Backderf also wrote the book "My Friend Dahmer" about his classmate named Jeffrey (yes, that Jeffrey Dahmer). 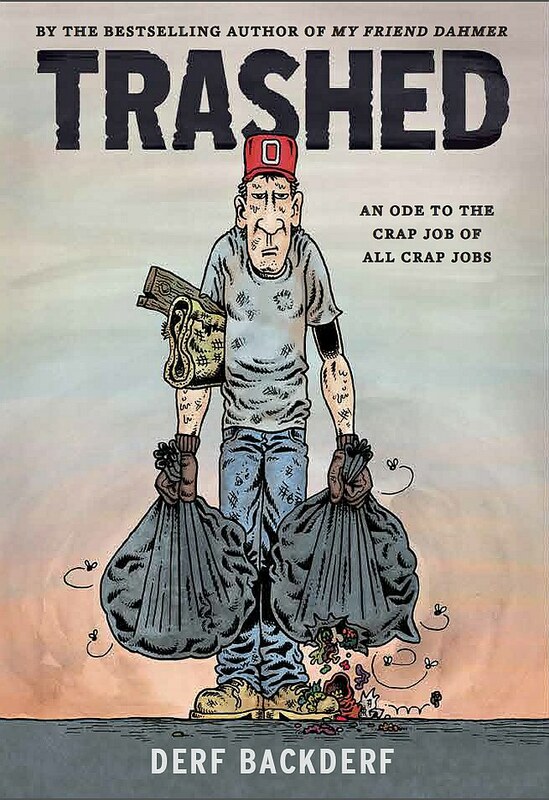 Backderf worked as a garbageman just after his high school years, and "Trashed" is a fictional story infusing some of the experiences. I thoroughly enjoyed reading "Trashed" for several reasons. The artistry is excellent, with the story unfolding in long-form panels reminiscent of "The City" and of another outstanding graphic novel, "The Book of Genesis Illustrated by R. 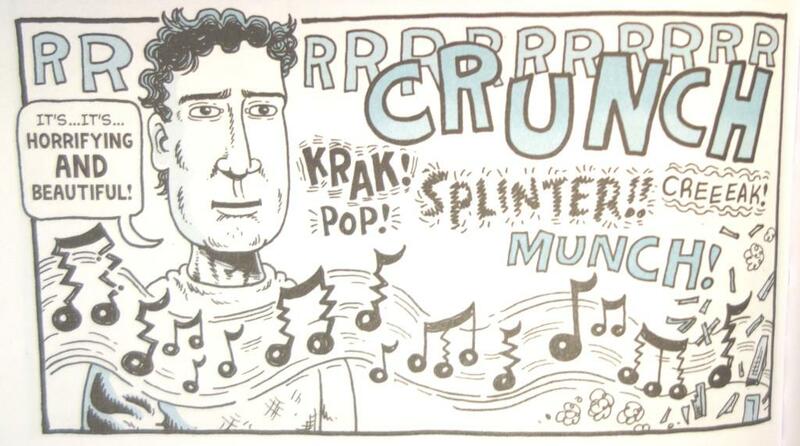 Crumb." One of the great things about Backderf's drawings is the way he accentuates quirks and idiosyncrasies of the most eccentric characters. 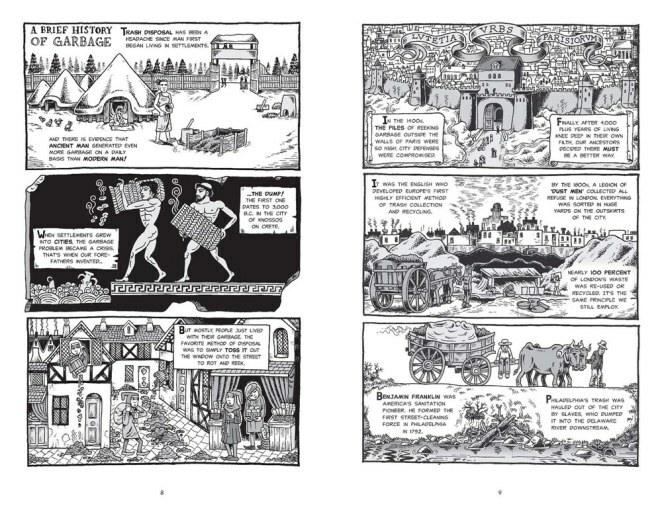 For example, on "Trashed" pages 104-105 readers are introduced to a loathsome landfill manager, and through Backderf's pen and ink you can almost smell the guy sharing inappropriate jokes with the main trash men driving their truck. Several community members -- folks leaving out their trash at the curb -- get star treatment; I imagine a creative way Backderf got the last word on some of the more difficult personalities he encountered in the field at age 19. Backderf elected to present "a year in the life" of his protagonist garbage collector in four seasons. I liked how throughout each quarter-year, and in the book's prologue section, Backderf dropped in detailed and recent facts and figures about trash collection across the U.S.A. This blend of history and by-the-numbers data jumps from the page in beautiful infographic form that reminded me of dizzying numbers on the pages of "The Big Necessity" by Rose George. 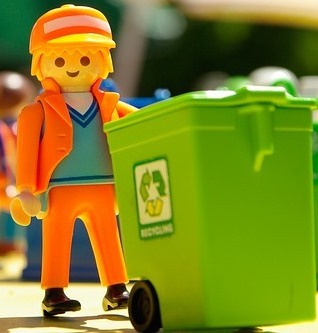 Did you know each U.S. citizen is responsible for about 2.89 pounds of trash per day? That's a staggering 1,054 pounds per person per year (!!! ), according to one statistic cited by Backderf. 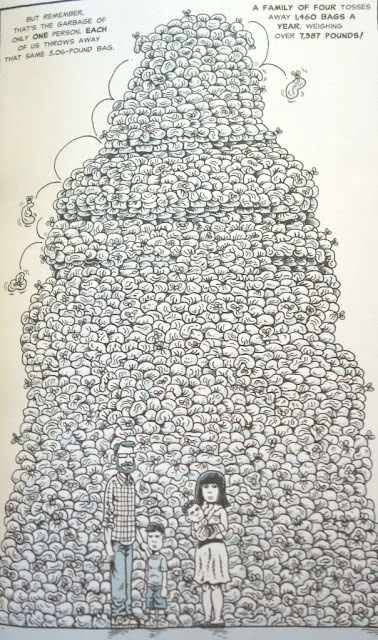 I laughed out loud as several page turns revealed large illustrations (one including a bee-keeper helmet is priceless), the mayor's reactions during a first visit to the Sanitation Department, and punk kids picking on the workers (and the garbagemens' version of revenge). 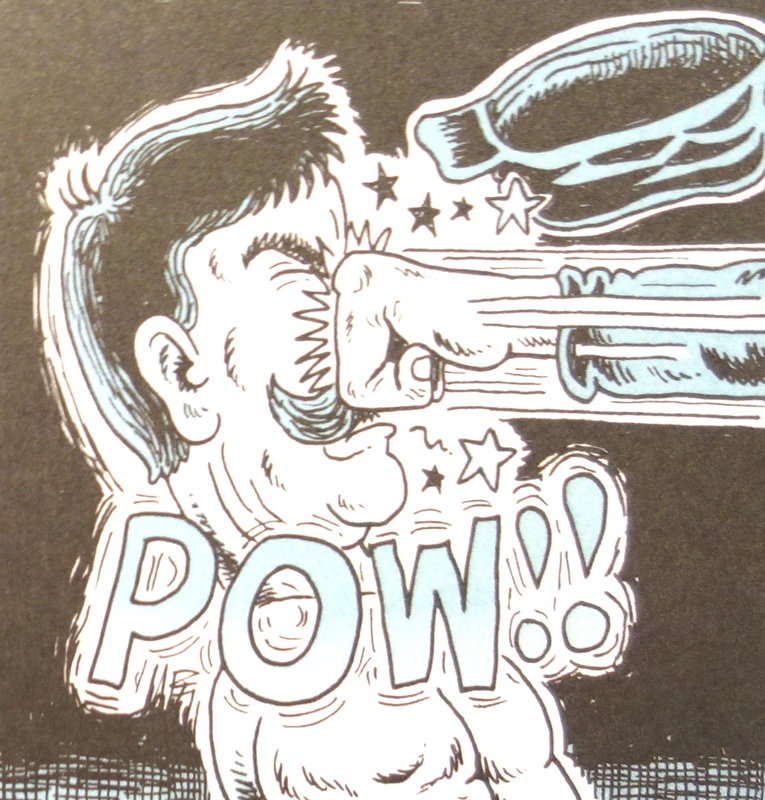 There are even a few classic comic tricks and tactics used, such as the occasional "POW!" 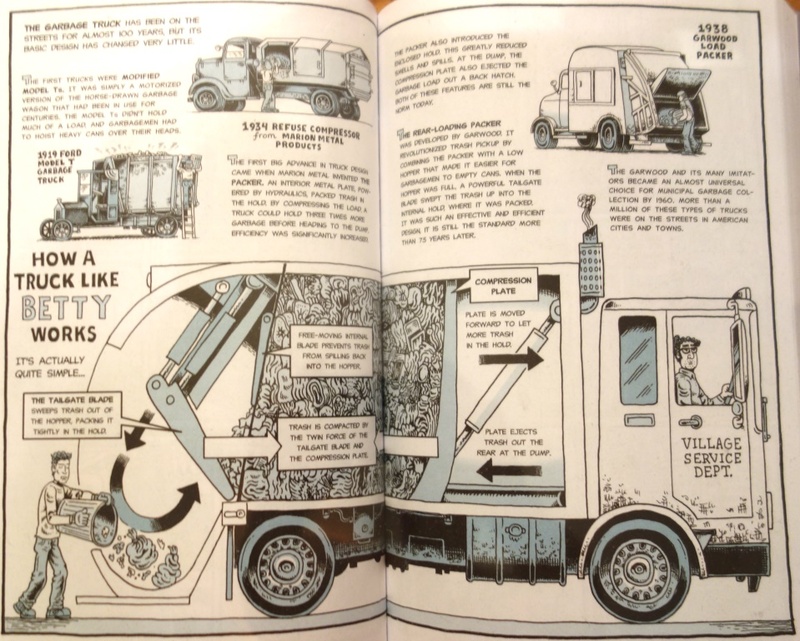 or Backderf's brilliant, musical illustration of a trash truck devouring an upright piano. A scene featuring roadkill may make some readers squirm even more than the data on diapers disposed by a single family in one year (Hint: garbage collectors deal with a LOT of sh*t!). Backderf even traces trash collection history back to ancient Crete, in 3,000 B.C., about the same time things were happening to shape sports history in nearby Olympia, Greece. According to the author's notes, "Trashed" started as a 50-page comic book, and the new paperback version is a quick read with 240 pages. I highly recommend folks check out Backderf's look at the Olympics of garbage collection in "Trashed." Just be mindful of the paper waste created when they print receipt! Cover art via Abrams; all other illustrations from the pages of "Trashed" and the site for "The City" cartoon archive by John Backderf. Playmobil image via Pixabay.